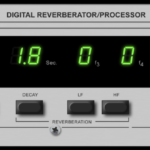 In recording studios, PA rigs and guitar racks all over the world the TC Electronic 2290 is known as the industry standard Digital Delay. The explanation behind the achievement of this position is crystal clear sound quality combined with unique features, that allow you to work with effects and music in a creative way. The 100 dB dynamic range, 20-23000Hz soft roll off frequency response and 1 MHz samplerate are part of the t.c. electronics design philosophy. In the studio it means no compromise where recordings for compact disc are concerned, and to the performer, the 100 dB dynamic range means crystal clear sound, eliminated hiss and the headroom for all the ‘punch’ needed. The TC 2290 features a large number of dynamiC echo effects allowing you to add delay echo and repeats controlled by your playing. Numerous delay modulations allows you to create exiting chorus, ADT, syncronized flanging, even chorus effects on long delaysettings. The stereo panning facilities create new ways of using the stereo image dynamically. Also the modulation effects can be made simultaneously to make effects like a ‘dynamic echo chorus with stereo panning’. The built-in connections to control other equipment enables very practical ‘total’ performance systems to be set up, controlling all the TC 2290 delay effects simultaneously with 5 external effects racks or pedals as well as MIDI controllable effects (& keyboards). All of it is remote controllable with simple ‘press a button’ commands from e.g the TC 0144 SRC stage remote control panel. All music performers come across the wish to make some specific change of settings ‘at the push of a button’. 100 Preset sound combinations certainly helps doing easy changes. But often there is more to it. ‘I would like a simple remote delay time setting button’, a ‘bypass’ or maybe a ‘change volume key’. That is why we have included a number of ‘programmable’ keys and personalization facilities. This also means that any key(s) on the front of the TC 2290 are readily made remote keys when you need. New Effects, Half a Minute Delay and other options. The software control of the TC 2290 and membership of the TC Software Club will allow you to add new effects and controls with the TC 2290 through the simple change of a low cost ‘softwarechip’. The TC 2290 has the facilities for adding options like half a minute delay memory with no sacrifice in soundquality, connections to your needs whether it be remote controls, computer sequencer or control, or maybe the next generation of MIDI. With extra memory for longer delay times fitted, the sample record and playback option really becomes a use full tool for recording, modifying and playing back sequences of sounds live and in the studio. Up to 100 preset samples can be recorded and played back in various extractions. When shifting back and forth between delay echo and sample effects, the sampled sounds can remain unaffected ‘in memory’. At t.c. electronics we realised that there is a genuine need for a digital delay capable of meeting the studio demands for compact disc quality recordings. Also for live performances a high quality delay unit were missing. A delay unit capable of doing better than ‘hiss and clip’ of the precious details and the ‘punchy’ parts of live-music. The vital soundquality of the TC 2290 was specified. A tendency within digital audio equipment is an ever increasing complexity, not only in the effects provided but also in the control of them. What was lacking was the means to integrate previous, new and coming effects into a ‘system’ that can be set up and used in a simple and trouble free manner. The inclusion of the external effects control, the TC LINK and MIDI provided the answer to this. We also found that there is a need for a piece of equipment, that is capable of lasting longer than the typical short product lifetime of most delay units. Software programmability of all TC 2290 effects and control and the facilities to add hardware options provided the answer to this. With low-cost software, adding new effects and interfaces is possible. Effects and interfaces with capabilities beginning to appear limitless as time goes by. The 32 seconds optional delay time for sampling possibilities is a ‘hardware’ option example, others are future interface possibilities through a built-in option-bus connector. Finally the TC 2290 had to be able to meet the stringent demands of an on-the-road life or 24 hour studio use for many years. This called for a durable construction with reliable topquality components for a lasting and troublefree operational lifetime. Easy serviceability through full documentation (Service Manual) fault-diagnostics software and easy identification of components. TC Electrnocis TC2290-DT is a groundbreaking, versatile delay solution that features a dedicated hardware interface with full DAW integration and powerful signature presets that will fuel your inspiration and add instant character to your tracks.